This ticket is for a dinner at Bourbon Street Bar & Grille NYC that ends at 7pm. This ticket does NOT allow guests to remain at the venue for the 8pm party at Bourbon Street Bar & Grille NYC. A seperate ticket purchase is required to attend the 8pm party. Guests with tickets for both the 5pm dinner and the 8pm party will NOT have the same seat for both events. The 8p NYE party at Bourbon Street Bar & Grille NYC accomodates guests age 21 and up ONLY. Guests must present a valid ID to attend the 8pm party. The 8p NYE party at Bourbon Street Bar & Grille NYC accommodates guests age 21 and up ONLY. Guests must present a valid ID to attend the 8pm party. 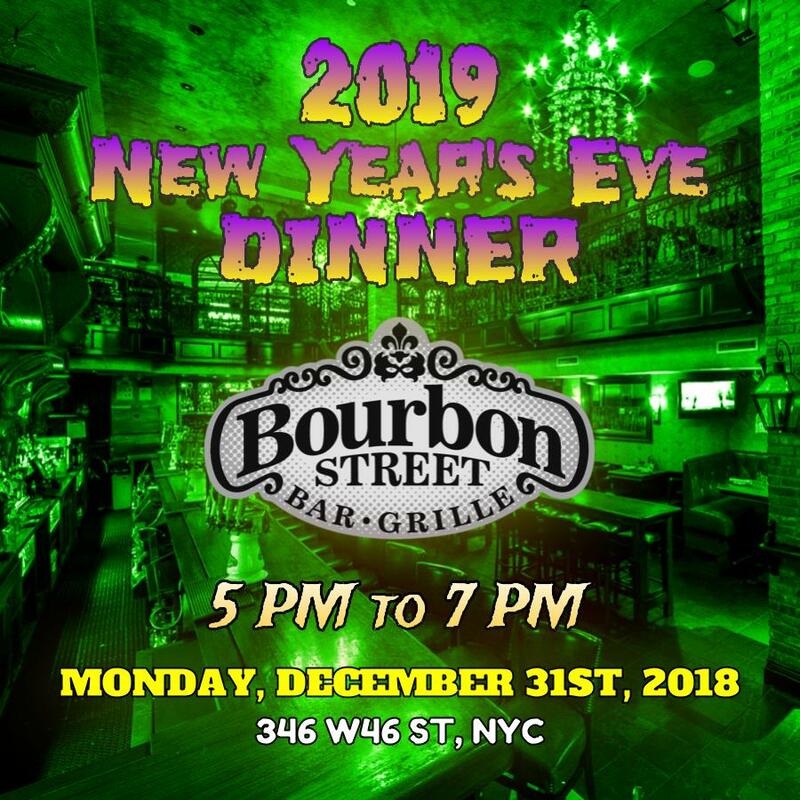 Before you get ready to ring in the New Year, head to New York City, Times Square’s Bourbon Street Bar & Grill for a delicious, all-ages feast that will give this year the sendoff it deserves. Whether you’re celebrating with your family or preparing for an exciting NYE party, Bourbon Street’s charming New Orleans vibe will add a dash of the Mardi Gras magic to your NYE holiday spirit. And what better way to spice up the night’s celebration – not to mention a brand New Year – than with a gourmet dinner of Bourbon Street’s delicious, Bayou-inspired cuisine? Radiating a Southern-style charm right in the heart of dazzling Times Square, NYC, Bourbon Street is an inviting bar and lounge boasting a fanciful, speakeasy-chic design. With a ground level of inviting space furnished with plush leather couches and intimate banquettes and booths and a second floor mezzanine of baroque accents that fills the venue with an alluring atmosphere, this Times Square nightlife favorite is the perfect setting to start off your NYE celebration with pizazz and a thoroughly satisfying, two-hour prix fixe feast of Bourbon Street’s delectable favorites. BARRICADES. The NYPD set up security checkpoints, called Barricades, throughout Times Square. The NYPD will ask you to present your physical ticket, which are also your entry tickets to the event. Locate your entry point based on the event you are attending below. Your entry into Times Square cannot be guaranteed if you do not follow these designated ENTRY POINT instructions. Your physical tickets must be on you at all times in order to gain entry into Times Square and your event. TIME. Moving through Times Square on New Year’s Eve can be a slow process. Make sure to give yourself plenty of time to travel from your hotel or starting point to your party destination. There are police checkpoints throughout Times Square and the wait times may vary. The “doors open” time is located on your actual ticket. We strongly recommend arriving at least 1-hour before the scheduled opening time. NOTE: Trying to enter Times Square after 9:00 PM is difficult and strongly discouraged.